Well we have been back for just over two weeks and they have been a whirlwind. Adjusting to life back in Canada, or 'home', has been a little overwhelming at times. However, God has been faithful, as He always is. He is carrying us day by day. So Ernie is driving truck and feeling the aches and pains of that. I am back at NAPA Auto Parts, where I worked previously. I have found a gym and am trying to find a routine to life. My days are full, working my 8 hour shifts, and then trying to visit my mother in the hospital. Praise the Lord she is recuperating well. We continue to enjoy being with our children and families. Basically we are creating a new 'normal', which is no easy task. So, while I have enjoyed these past four and a half years of chatting with you... I am closing the blog down. Essentially, the reason for having it has ended. Now I will try to share my new world with my friends in Mexico. You can follow me on Facebook and Instagram, where I continue to post random things about my life. Thanks for following our lives and being a part of some wonderful years. We are so thankful for God's faithfulness in our lives. Last week I told you of the struggle to re-adapt to our own culture, to re-aculturate (reverse culture shock is always more difficult). Well, we have been enjoying our children, enjoying some hockey play offs, and enjoying our church family. That said, we got a little surprise this week. My mother fell and broke her hip. She was transferred to Winnipeg and had surgery the next morning. I was able to sit with my mother in the emergency room, while she got the news, and I was able to sit with my father while my mother underwent surgery. Although I didn't necessarily enjoy that, I would rather do that than be miles away, waiting for news. Her surgery was a success and now we walk the journey of therapy and recovery. She is content and resting in the hospital. We anticipate her being transferred to Steinbach this week. So, that was a turn of events for the week. But I am so thankful that she is okay and that I could/can be there for them. We just finished Bible Study with our group from Guadalajara. We are so very thankful for technology and how it makes things possible. They had asked before we left if we would continue to lead the study for them through Skype. They knew that Ernie had done that for our sons for the past two years. So today was the first one. They are wanting to finish the TEE course on the life of Jesus based on the book of Matthew. We completed book one before we left. They quickly purchased books 2 & 3 to show they were committed. What a great evening of studying the Word together, and then being able to pray for them and their concerns. So we continue to live between our worlds: Skype Bible studies, WhatsApp conversations, FaceTime calls with our friends abroad, and face to face reconnecting walks and coffees with friends and family here. As they often said, and have repeated again and again after they heard about my mother, "God doesn't make mistakes." No He doesn't. We are here for a reason and He will walk us through our transition. Well we made it! We travelled 4,000 kms, from Guadalajara, Mexico to Steinbach, Manitoba. It was quite the journey, from our announcement of our leaving, to our arrival in Canada. But it is done. While we had purged our possessions down to what we thought we 'had' to take, we still had more than our little Honda Accord could handle. So we asked our dear friends Sergio and Claudia if they would be willing to go along, with their truck, to haul our stuff to the US border. They were more than willing. 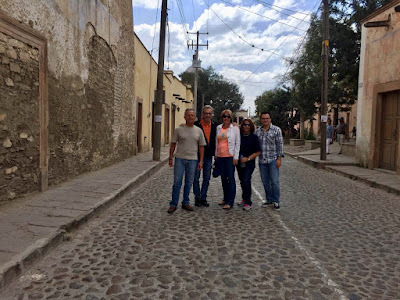 So, with two vehicles loaded down, we began our journey on Tuesday morning at 5 a.m. Our trip was basically uneventful and we arrived in good time to deal with the border crossing. However, our friends helping us till the border only got us to the border. Now what? We had looked into renting a U-haul, or some other rend-a-truck. But other plans transpired. Our boys decided they needed a road trip and they just happen to own pick up trucks. So they invited some friends to join the party and made an event out of it - a road trip. It actually made things better in several ways. Firstly, just getting to the USA and seeing our boys was priceless. But if you know our boys at all... they made our last good byes to our dear friends less painful because they are so crazy. I will leave that there, with a picture which is worth more than a 1000 words! We spent the night in Laredo and then headed to Corpus Christi, as they said being that close to the ocean warranted a visit. It was a little disappointing, and cold, but we took a day off to just hang out. Good relaxing day for us. Words can't express how grateful we are for these guys coming down to get us. I only had to drive from Kleefeld to Steinbach, they did the rest! They were also just a blast, their craziness helped me to not just over think everything and cry. Biggest highlight has been being with our sons. We have actually moved in with Chris, our youngest. Strange to live in "his' place, while being the parents. His house, his rules, etc. Some adapting, and setting boundaries for ourselves. But so nice to be able to cook and do laundry for him. The worst part was cleaning at three places. 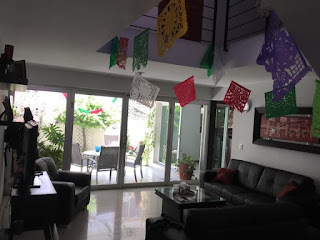 First, at our GDL home, which we turned over at the end of March. Then a lighter cleaning of Reimer's house, where we lived for the month of April. Then, arriving at Chris's condo... well, let's just say it needed some TLC (from a mother's point of view). Not to mention that we had our 'junk' all over his space. Moving form a 3 bedroom, two story house with walk-in closets, to a small condo, has been a bit of a stretch. But we are so thankful that he took us in and we don't need to make any huge decisions immediately. We have two weeks to recoup and look after logistics, following which we both have new jobs. We are going through reverse culture shock. We are 'home' but we are not. We are grieving. We are hurting. But we will adapt, and with time will fit back in. We covet your prayers as we walk this new journey called adjustment. So very many lasts...so many good byes. While they have felt heart wrenching, we leave feeling so loved. The photo on the left is of great friends, whom we love dearly, and will miss. We originally met them through the Reimer's, as they attend their group. But they became very good friends of ours as well. We enjoyed a lovely afternoon/ evening with them this past Saturday. And oh, did we eat! Or should I say over-eat!? We ate and laughed and enjoyed ourselves. A rich evening together. Good thing is that Rick is from Rosenort, and Omar's mother lives in Ontario, so we will most definitely see them again! Not to mention our desire to return to visit. Then we decided to throw an open house, to give everyone one last chance to come and say good bye. Not necessarily something we wanted to do ... be hugging and saying good bye again. But letting go is hard, for both sides. The invite was from 11 a.m. to 11 p.m. Like we may have been just a little crazy, but such is life. Our first guests showed up at 12 noon, and the last ones left at around 11:15 p.m. Let's just say it was a long day, and then a short night. Mexican's are crazy that way... they love a reason to party. Short nights and long days are par for the course. So Monday it was off to the gym ... one more time. Some more good byes. Then we headed home to pack up the last pieces. You think you don't have much stuff ... not true! Then, at 6 p.m., I headed back to the gym for one last class. My favourite instructor, Nelson, invited me to attend his Advanced Danzika class, and asked my regular class ladies to join. So, for 45 minutes, I pushed my tired self through an advanced class. I so remember my first class, thinking I would never get it. Now, just over 3 years later, I can handle an advanced class. It was fun. I was proud of myself. More good byes. Headed home, so Ernie could pack up the car. Then our friends came over to pack up their truck with the rest of our stuff. Some more good byes. Then I hit the hay ... exhausted. We got up at 4 a.m. Hit the road just around 5 a.m., along with Sergio and Claudia, and their daughter Sara. After a long day of driving, a speeding ticket, and a rude Immigration Officer, we got in the long line to cross the bridge in hopes they would let us take everything across without going through all of our stuff. While in the line Ernie noticed a low tire, almost completely flat, which he began pumping up while in the lineup. We were then let across without a hassle! They asked a few questions and let us go. God went before us! When we arrived at the hotel the boys were waiting! While we were excited to see our boys, we went through another set of good byes. Sergio and Claudia and their family have been such good friends. They are evangelical believers, which gave us another connection. We love them and will miss them greatly. We are hoping their boys will visit this summer. As you can see from the above picture ... our boys bring fun, laughter and much joy. We have already made some good memories with them. They have helped to begin the healing from the hurt of so many good byes. This weekend began our group farewells...and groups they were. The gym ladies threw me a farewell breakfast and 30 showed up! I was overwhelmed by the love of these people who I see daily. A speech was given by one of the ladies on behalf of the group. I then responded to that, which led us all to tears. Basically my speech is a version of the same. I may have been invited to a gym (for exercise) but I actually got invited into a family. That I was taking each one of them along in my heart. That it hurt to leave but would hurt a little less once I was with my (blood) family. I thanked them for their love, their acceptance, and for all the good times we shared. That same afternoon the gym men threw a lunch for Ernie. Again, a fairly large group came, and, being less emotional than women, they sat around, ate, and chatted. However, Ernie's table turned into a deep discussion on religion, faith, etc. One made the comment that it took till Ernie's departure for him to have this kind of discussion with Ernie. Saturday we had the whole gym farewell, and they threw us a spectacular party. A taquiza for our meal (tacos), then they brought in a full mariachi band for two hours. The last song they played was called "Las Golondrinas" (The swallows). It is a teary farewell song, during which everyone could file by and say good bye. Tears were a plenty. These are the people we have shared our lives with on a daily basis. Sure, we went for exercise, but we were also a family. We celebrated birthdays together, anniversaries, had field trips, etc, etc. We shared our lives with each other. I have made the comment often, in recent weeks, that if you have never lived within a latin community you can not understand how they take you in, embrace you, love on you, make you one of them. It is an overwhelming feeling. Taking that into account, leaving this community is heart wrenching and painful. While it is not the first time we have done this, it hurts the same each time. It is double hard because our own culture is less like them. We are more reserved, less embracing, and each person has their own 'personal space' factor (you can have one in Latin America but they don't respect it). When they choose you, you are chosen. We not only know them, but their children as well. They shared their families with us. Parents, children, some aunts and uncles, grandparents. It is a wonderful culture to live in. Then after two days of gym good byes ... we had a farewell by our neighbours. Within our 'coto' (gated community) I was asked to join the ladies breakfast group. We got together once a month to celebrate whoever had a birthday that month. These ladies were wonderful and I love them a bunch. Now, while the ladies are good friends, the men never really got together. Ernie became friends with most of them and therefore we made this a family event. He also became friends with their adult children. So we had a lovely Sunday afternoon together with a fabulous 'carne asada" (bbq). That means, barbecued meat, chorizo (sausage), onions, served with quesadillas, beans, guacamole, nopales (cactus), etc. While the meal was fabulous it's the people that make it special. We also felt that Coto Los Narañjos was home. We had a community where we felt safe, felt a sense of community and family. This too will be missed. So we are now on our last week. Our final good byes are getting said, our boxes are packed, and our looking forward has begun. There is a saying here "El que mucho se despide pocas ganas tiene de irse" which means, 'he who says good bye often has little desire to leave'. And that has been the case. So we are throwing one last farewell to give people one last chance to say Adios. We will host an open house on Sunday, for the day, serving snacks. It will be a long, emotional day, filled with tears and laughter. God is good. He has been faithful. We leave with holes in our hearts that will heal with time as we reflect on the good times. And the world is smaller... so we'll stay in touch!! As I sit here, outside on the patio, having breakfast and writing this blog...I ponder how this is soon to end. This sitting outside and enjoying the wonderful weather, eating outside without bugs! Alas, all good things seem to come to an end. We turned in our house at the end of March. What a job that was! Going through our things, having thought we didn't have much! Trying to sort of pack, but needing some things. Selling some things. And then that least favourite part...cleaning! Our neighbours made the comment that we sure were cleaning a lot, and that just isn't done here. They leave the house a mess, if not totally trashed, when they move out. We left it so that you could eat off the floor! We knew that they are coming in to paint, and fix some things, which would only mess things up again. But, that is just how we do things! So now we are settled into Reimer's house, as they are in Australia, visiting their children and grandchildren. Why pay two rents when we don't need to? It benefitted both of us. It is nice to have a bed again, not to mention a kitchen. Our last couple of weeks we were on air mattresses and eating off disposable plates! So, while we are in a state of deciding, keep it, gift it, or sell it, we continue on with our lives. We go to the gym 5 days a week, mostly because that is where we see 'our' friends and want to do that as much as we can. We will miss this part of our lives a whole lot, the exercise and the people. The exercise we can get wherever we are, technically, but not our coaches and instructors. I will miss my classes even though they leave me done in. I will also miss the ladies I take the classes with. We also continue to get together with our study groups. We were excited to graduate our Thursday ladies but are continuing with them till we return home. We want to take the next little while to teach the rules of hermeneutics (how to interpret scripture). They have grown so much that we want to give them all the tools possible to continue to study the Word of God. We also continue with our Tuesday group. They are almost done book one of the TEE course on the Life of Jesus, based on the Gospel of Matthew. They are a constant source of joy as they hunger to learn and grow. They have asked to purchase the next two books before we leave and want to Skype us in on Tuesdays for now. We have had some rich discussions together and have come to love them deeply. We are excited about continuing to study with them across the miles. Please pray for our friends as they continue to seek to grow their faith. Our world is so much smaller and we can continue to encourage one another in our walks with Christ. We are not counting the days yet but are very close to that being the case. God has been faithful and will continue to be so, for he never changes, He is the same yesterday, today and forever. Sitting in front is Sandra with her newborn son, David. Next to her is Lili and her son Leo. As you can well imagine, Thursday mornings are a joy for us. We are so very proud of this group for several reasons. Firstly, Sandra (in blue) is the one who came to us and asked if we would be willing to lead a Bible Study for her, her sister and their friends. She has a truly missional heart. We had one leave after the first few studies, and one asked to join later. The picture above is of their recent graduation. We spend more than 40 hours together going through a TEE course together. It was a panoramic study of the whole Bible. They faithfully came, missing only when necessary. They asked questions and demonstrated a willingness to learn. Most of these ladies are from Catholic backgrounds. They had a hunger to learn from Scripture, and more and more learned to trust Ernie, and asked very good questions. We all learned together. Now, as you can see from the picture, most of them came with kiddos. So I could most often be found on the floor with said kiddos. My goal was to make it as easy as possible for them to learn, with the least amount of distractions. I came to really enjoy the kids, and they learned to love Ernie and I as well. Another thing that excites me is that they want to keep studying. They loved learning how the bible was put together, that it isn't just a bunch of random stories. They often saw things that made them question their own beliefs and asked questions that made us search for answers. As already mentioned, we all grew together. 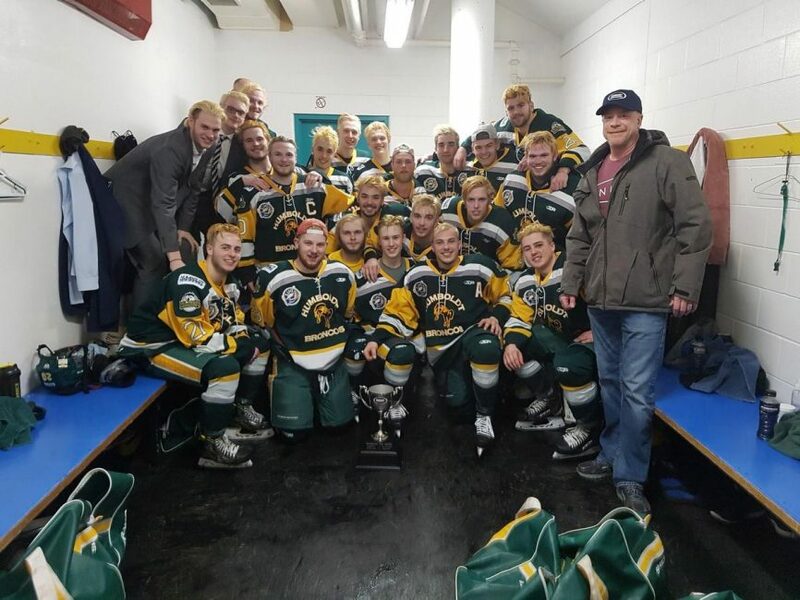 They plan to continue with Tara Wiebe, and study the TEE course on the life of Jesus Christ, based on the book of Matthew. We are planning to continue with our group that studies on Tuesday nights. They are just finishing book one of that six book series in Matthew. They have asked for Ernie to continue to lead them via Skype. So we will give that a go. Our other group has finished both of the above mentioned courses. Well, Paty has finished all of them. Teo has finished the panoramic study, as has Bertha. They at present are studying the Pentateuch. This is a much more intense course. We are working through it together, line by line. We will see how they will proceed. It is such a blessing to study the scriptures with people who are eager to learn, and grow. We have been richly blessed these past four years with great study groups. May we always desire to study the Word and be willing to help others understand its truths. In today's Bible reading I was reminded of this photo. In 2 Timothy 1:5 Paul tells Timothy about the sincere faith "which first lived in your grandmother Lois, and in your mother Eunice." Pictured with Ernie is part of the verse in real life. Seated is Hermana Licha from the Fuente de Vida church in Chihuahua. Seated beside her is her daughter, Vivi. Not pictured is Licha's mother, who has gone to her eternal reward. Licha's mother was a godly woman, who passed her faith on to her daughter, who passed it on to her children, and her grandchildren. These saints modelled Christ-likness. One left a great legacy and it is carrying on in her children and grand children. Licha is also the mother of Aldo, who was the pastor of the Fuente de Vida church in Chihuahua. He, and his wife Rebecca, have also gone on to their eternal reward. Aldo often spoke of his grandmother and her faith. 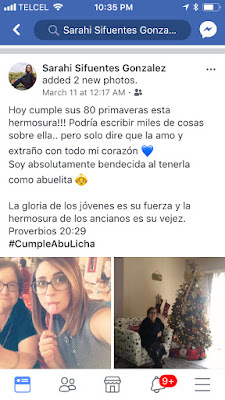 To the right is a post from Facebook that was posted by Licha's granddaughter, Sarahí. She quotes Proverbs 20:29 "The glory of young men is their strength, gray hair the splendor of the old." She wishes her grandmother a happy birthday for her 80 'springs". She speaks of the blessing of having her for a grandmother. I am also honoured to have a godly mother as an example for me and for my children. I am thankful for a rich family heritage of faith. I am also blessed to have that same heritage for my children in my husband's family as well. Now we may not all have that kind of heritage, or those wonderful examples in the faith, in our bloodline. But there are always examples of godliness. Look for them, search for role models of faithfulness. Ernie and I also have a dear friend from San José de Gracia in Nicaragua. Doña Deborah is also in her 80s, and is a wonderful godly woman of faith. Every time we see her we say goodbye, wondering if it will be the last time, this side of glory. Doña Deborah is also leaving an amazing legacy of faith and faithfulness for her children and grandchildren. What will your legacy be? 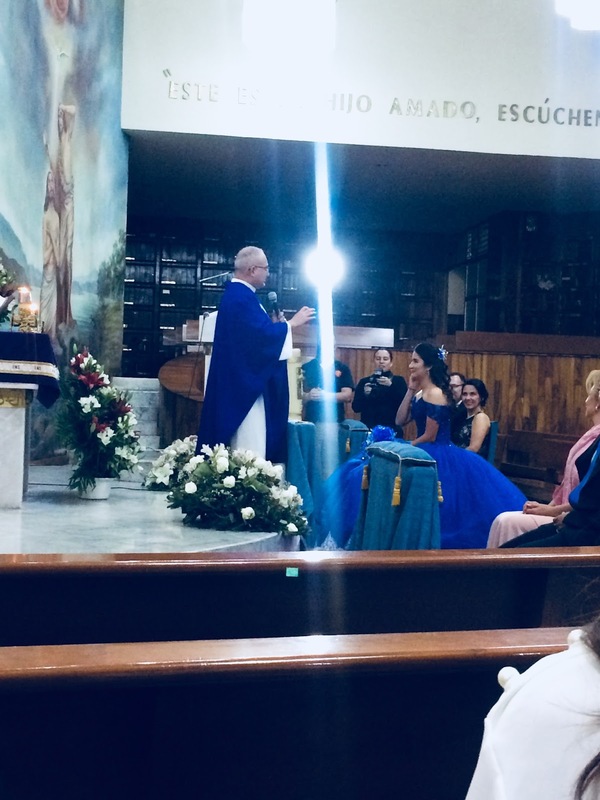 I have gone to mass quite often since living in Guadalajara. My reasons for attending have varied. I have gone because someone has lost a loved one, I have attended infant baptisms, First Communions, and even mass prior to a birthday. I love how Catholics go to mass to honour or to thank God for something. The very first time I attended a mass here was for a first communion for the daughter of a friend. The invitation stated the hour of the mass, which Parish it would be in, and then where and when the celebration (party) would be held afterwards. I anticipated seeing all our friends from the gym at the mass, as they all tell us how Catholic they are. Other than the family of the child whose first communion it was, one other lady from the gym was present! But, for the after party/celebration...tons arrived for that! Was not the event the First Communion? Was not the whole thing religious? So why did most of them not attend? 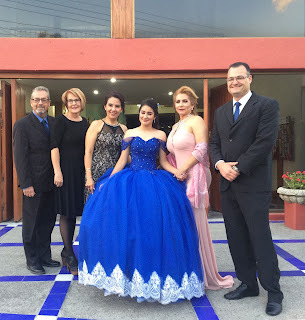 The picture beside is from a Quinceañera we attended. It too began with a mass. Here too, the amount of people at the party, versus the amount who attended the mass, was very different. I love the fact that there are many traditions and rituals, but it sometimes appears to evidence what we might call legalism or Phariseeism - bound to tradition but having forgotten the reason behind it. Now, this is not a criticism of the Catholic Church. I have attended beautiful masses, where the Priest has done a great job. In the picture you can see the that priest is in front of the Quinceañera. He actually directed his talk to her. He challenged her to guard her faith. It was wonderful.. Whether one is evangelical or Catholic, one must guard their faith. We need to make sure we don't just guard the traditions, but our faith as well. I sometimes liken the tradition to a Coke bottle, and the faith, or relationship with God, to the contents. You need the first to 'contain' the last, but there is no question as to which is the most important. We need to ensure that our faith is based upon Scripture and not on tradition. I need to make sure that I am following Christ and not a tradition, or a person, or a 'religion'. I keep insisting, as I talk with people here, that it's not about religion but rather about relationship - a close, intimate relationship with Jesus Christ, which changes my values, attitudes, and behaviour. I am constantly amazed when living abroad. I have lived in Latin America on and off for years. I have live in Mexico for many of them. But yet I often experience, or maybe rather notice, something new. This weekend I went to a baby shower for my friend's upcoming grandchild. Baby shower's are not something new for me; I have attended many. My first observation about baby showers here was that I often got invited to them, when I did not even know the mother, sometimes never having even met her. But, what I observed this time was that they have a baby shower for every child a mother has: first, second, third, etc. We often only throw a shower for a first baby. The next thing was that often the mother, or mother-in-law, hosts the baby shower for her grandchild. I can't say that that is something we do in Manitoba. They also go all out. The place is all decorated; that's normal. They serve a meal; not common in Canada. We would more often have snacks. They have a lovely, decorated dessert table, regardless if it is breakfast, lunch or supper. They give party favours to all the guests. Lastly, they always know the gender of the child and have chosen a name. I don't think that is common back home although maybe now it is. In my day we wanted it to be a surprise and had names chosen for either gender. This shower was hosted by my friend Tina, for her grandchild. It is this couple's third child, all boys. The child's name will be Iker. I had met the mother on a few occasions as I have attended some family events they have thrown. 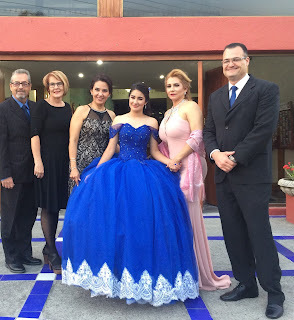 On that same day, but in the evening, we attended a Quinceñera for our friends' 15 year old daughter. We have attended many of these over the years. A Quinceñera is the birthday thrown for a 15 year old daughter - it is a 'right of passage'. A little like 'sweet sixteen' although much more significant (or a guy back in Canada getting his drivers licence). They usually thrown a huge party, often going into debt or saving for quite some time, in order to host it. Depends of the economic situation of the family. We have attended very elaborate ones and simple ones. When I am at one of these, and I see a younger girl, I will often ask them if they want a big party like that. I get varying responses, some say no, they would rather want a trip. Some say yes, and then there are those that say they want both! What I noticed this time around is that 15 is young. She is a young lady but emphasis on young. I noticed at this party that the young lady is highlighted in various ways. She dances with her father and her God (padrino) Father. Then she often preforms something. I was at one where the young girl did aerial silk. It was amazing. This particular event the young lady danced with 3 professional male dancers. This is what struck me, the way they danced. The young men were older then her and you could tell they had practiced quite a bit. Then they put her on a chair and danced for her! I thought it was maybe a little bit to much for a 15 year old girl, whereas everyone thought it was great! Another thing I noticed again was how formal these things are and how Mexicans love to dress up. I compare that to how informal we seem to have gotten back home. I was shocked last time I was home to see people in shorts and flip flops at a wedding! NEVER, AND I MEAN NEVER, WOULD THAT HAPPEN IN MEXICO! I have come to appreciate their love for formal events and their love of getting all dolled up. The women often get their hair done and their make up professionally done. Everyone always looks stunning. Even the young people are all done up. Changes how people act. It's nice. So, we continue to learn and grow here. We love so much about Mexico and its culture. We will miss it tremendously. 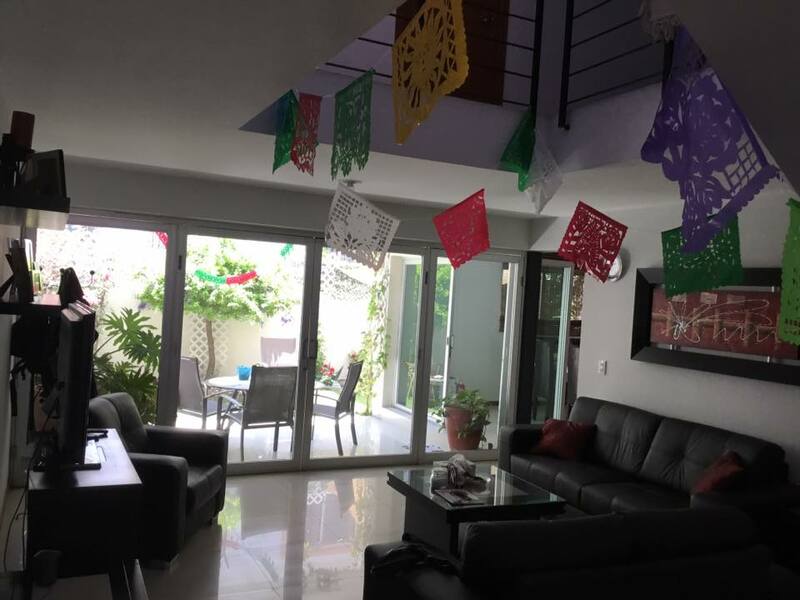 We have enjoyed having some friends from Steinbach over for a few days - they had been spending some time down at the ocean (La Peñita) and decided to come to GDL to visit! We are going to take them for breakfast this morning and then put them on the bus to return. So, today it looks like the blog post will have to be posted a bit later in the day... I hope you'll check back! I'm hoping to share some cultural things I've learnt this week. I should be back to get that up around noon. See you soon...!